CUE Success - Where are they now? CUE takes the 2015/16 5k Competition winners to Silicon Valley! The CUE Silicon Valley initiative was started in 2014, with the idea to enrich the experience of the CUE £5K competition winners. In addition to the £5K prize, the winning teams participate in an (all­ expenses ­paid) intensive one­week tour of the Bay Area, where they get to meet Silicon Valley­-based start­ups, multinational corporations, as well as incubators and investment funds. This summer, for the third time in a row, CUE brought the winners of the £5K business plan competition to Silicon Valley. 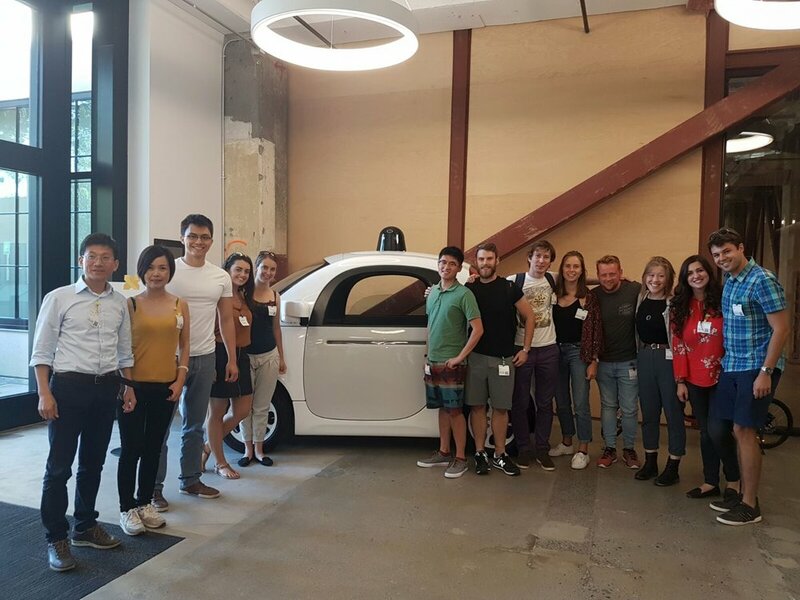 This exciting trip provided valuable opportunities for our startups to explore the fascinating entrepreneurial ecosystem around the Bay Area. What follows are testimonials written by the 2016 CUE £5K winners, describing their first-hand experience during the CUE Silicon Valley trip. Our first day in Silicon Valley began with a visit to the world­-renowned tech giant, Google. 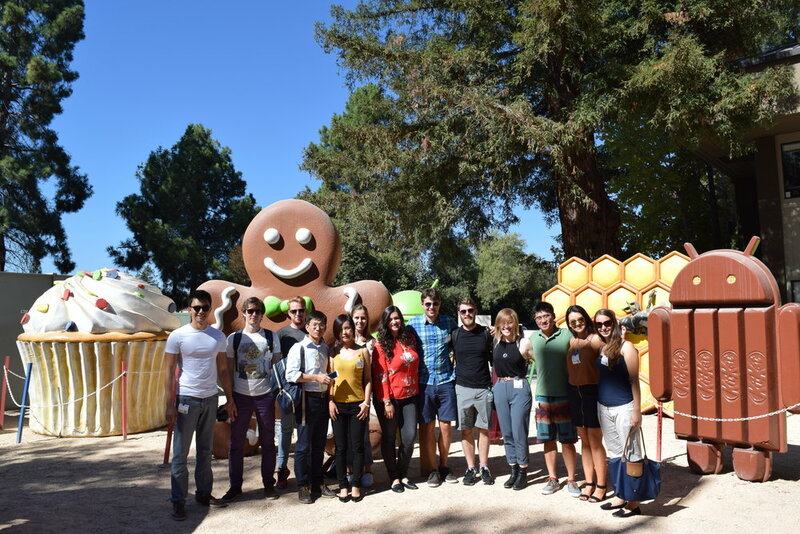 In the mist of San Francisco’s heat wave, several meetings were planned at Google X for us, but beforehand we took a tour around the famous Googleplex. With over 20.000 employees in their Mountain View site alone, unsurprisingly Google has designed their own bikes that support their bright green, red and yellow theme colours to help their employees manoeuvre their way around the colossal campus. But this is just one of the many ‘colourful’ and symbolic things we passed during our Mountain View tour, including a playground of large android lawn statues, computer history museum, and a Google Maps street view designed car. After eating a complimentary lunch (where we were spoiled for choice) in one of Google’s many eateries, we drove to the Google X site and met with Philip Nelson, Director of Engineering at Google Accelerated Sciences (one of the many teams within Google X). After briefly pitching our ideas to Philip, he in turn explained some of the many projects his team are currently working on and opens our minds to the endless applications of computer science or “deep-­learning” within the healthcare industry. Philip kindly shared with us his team’s progress on a number of projects that utilize cell imaging and deep-­learning to predict the onset of diseases such as diabetic retinopathy and sporadic ALS. Definitely watching this space! Afterwards, Obi (Wan Kenobi) Felten, Director of Consumer Marketing at Google X’s Moonshot Factory, joined us. Obi gave us a top-­level overview of some of the projects that stem from her team, such as Project Lune­providing internet access through balloons that are flown over regions with no Wifi, Project Wing­fast food (burritos being the test dummy food choice) drone delivery, self­-driving cars, and glucose­-detecting contact lenses for diabetes patients. 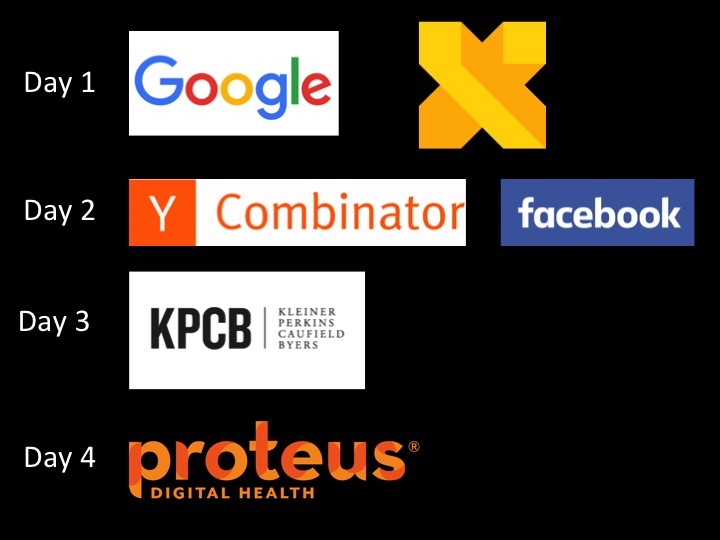 Obi put a lot of emphasis on how Google X differs from other Alphabet companies: tackling BIG problems that have the potential to make the world a RADICALLY better place! And what if the solution seems impossible to implement? Well, nothing is impossible, unless it defies the laws of physics (the reason why the space elevator project was not taken forward). Embarrassingly enough, before this trip our group knew very little about this hidden gem subsidiary of Alphabet’s. However, I think it is safe to say that this visit has left a lasting impression for all of us who attended. We do have one departing question for you Google X…..Are you hiring? In the afternoon we were given a tour of the Facebook campus, a bizarre place where beyond the security barriers employees exist in a mini Palo Alto parallel universe. Restaurants, healthcare, dentists, mechanics and launderettes take care of the essentials; while bars, salons, sweet shops, art­ studios, games arcades and wood work workshops are available to disrupt thinking and keep the culture creative. This may have been working too well however, as we counted four people at their desks… and we can only assume the rest were sitting on Facebook. After Facebook there was time to relax at the poolside (the Waterscope guys assured us it was OK to swim) before dinner in Palo Alto. This is day 3, another sunny and smiley day. We set off around 9:30 from Sunnyvale to visit KPCB, one of the largest and most established venture capital firm in Silicon Valley due in large to their past success. They were early investors in Amazon, Google and Netscape etc. A senior partner (Randy Komisar) sat for one and a half hours with us. He briefly introduced himself and the company followed by an engaging and lively Q&A session. We had many questions and he was very open and shared his passion and insights about start­ups and how to be part of the future. Start with a business with a good plan, however you need to discover business and chase the trend over time that will increase the chance of success from cycle to cycle. For investors, fight for talent is difficult; for start up, it is important to bring partners and investors with new network and prospective. Investors are mainly interested in investing persons rather than a business and they want to be part of the future. The top three qualities of a person attracting investment are vision, commitment and reliability. For a start up, you need to move fast and cheaply so that you can test your assumptions quickly. After success, you need to invest others to share your social responsibility. We had enjoyable a few hours free time in the afternoon. Some went shopping and some went to explore areas nearby. Dinner was at Stanford University with BASES (The Business Association of Stanford Entrepreneurial Students). On the final day of SV trip, we visited Proteus Digital Health, Inc. The company provides the world’s first digital medicine solution. The tiny ingestible sensors embedded in pills can track patients’ medicine taking status and provide physicians with information that cannot be measured before for making better healthcare decisions. 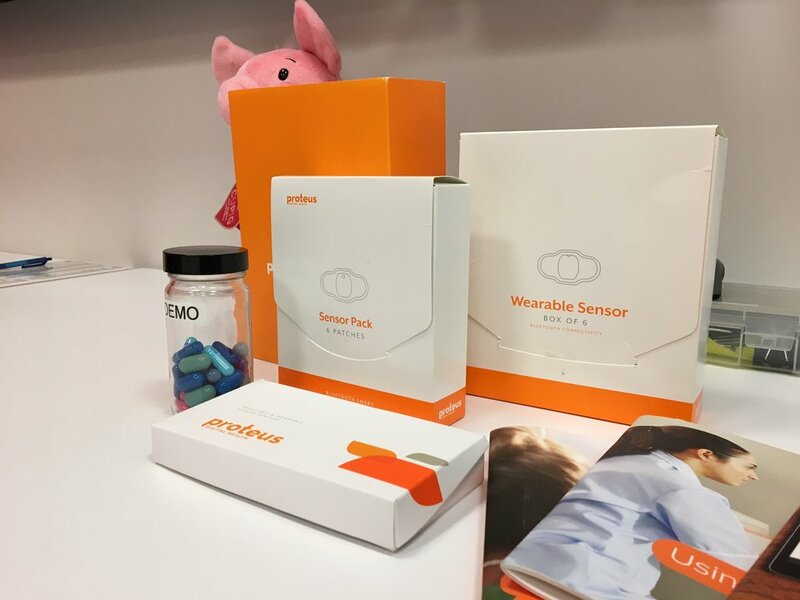 We first stopped at the manufacturing facilities of the company, where the ingestible sensors are produced and tested. The managers in charge explained the mechanism of digital pills and workflow of chip manufacturing. I was surprised to see that most of jobs were done by high­-precision robots and only limited number of workers were there to assist the machines. In the meantime, “NG:Safe” had few ideas of how to use Proteus’ chips in their application. After the visit, we headed towards the headquarters of Proteus in Redwood city. George Savage, Co­Founder and Chief Medical Officer gave us a presentation about the clinical results and market feedback of their products, showing digital medicine solutions have positive effects for patients. All four startup companies from Cambridge also presented briefly for ideas and suggestions from Proteus. In the office area, we saw the major leaps between several early stage prototypes and final product, reminding us a company needs to constantly evolve to stay competitive. We have officially finished our business trip at noon and the whole CUE team travelled to San Francisco together. We could finally relax and enjoy the view of Golden Gate Bridge. Needless to say, everyone has taken satisfying amount of pictures, selfies and group photos. The weather has gone much colder comparing to the first few days in Silicon Valley, but I believe everyone was filled with passion, since we all have found more than what we were looking for.